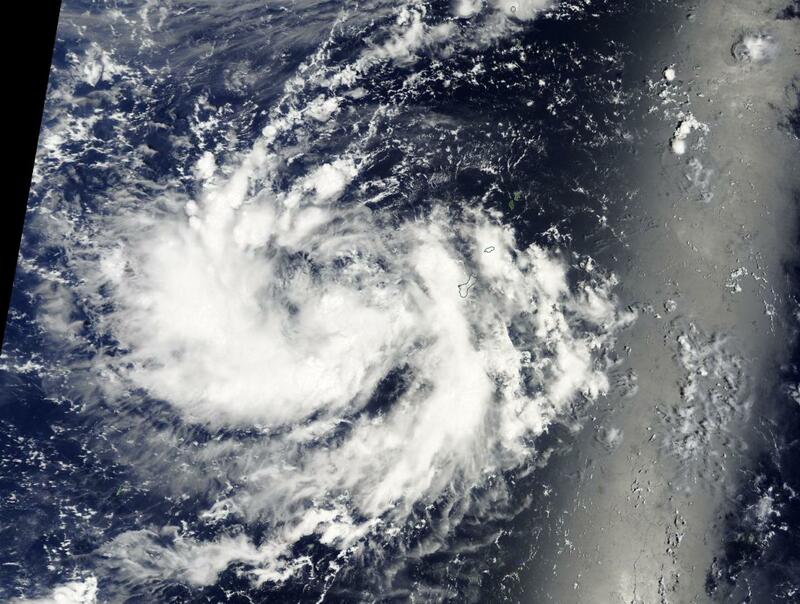 Tropical Depression 16W in the northwestern Pacific Ocean was spotted by the Terra satellite on September 08, 2016. The storm is currently moving northwest toward the island of Guam at 8 mph. It is slowly intensifying as it establishes a steady west-northwest track. Its speed is also expected to intensify in the next few days. Currently TD16W is located 220 miles west-northwest of Guam. There are no threatened landmasses at this time. Tropical Depression 16W has maximum sustained winds of 35 mph. Intensification is being forecast during this upcoming weekend and will most likely become a Tropical Storm later today. There is a possibility it could develop into a typhoon by late Sunday. Within 5 days the storm should be full typhoon strength with 125 knot winds. This natural-color satellite image was collected by the Moderate Resolution Imaging Spectroradiometer (MODIS) aboard the Terra satellite on September 08, 2016. NASA image courtesy Jeff Schmaltz, MODIS Rapid Response Team. Caption: NASA/Goddard, Lynn Jenner with information from the National Weather Service.